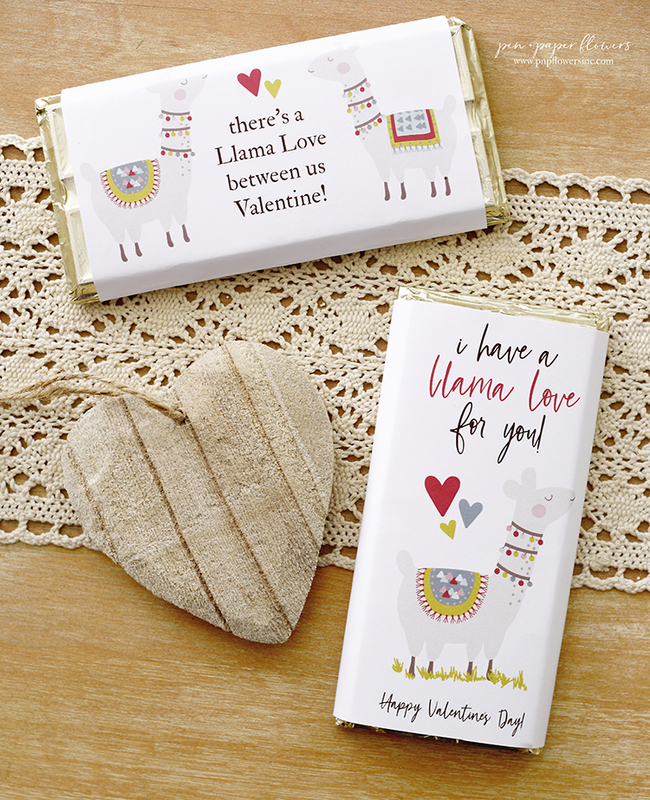 Simply change out the color of the confetti, Hershey's Kisses, Ribbon and Tissue Paper to match your specific celebration! 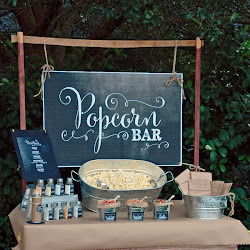 I created mine for the "Kisses + Confetti" themed baby gender reveal party I recently styled for Hershey's. 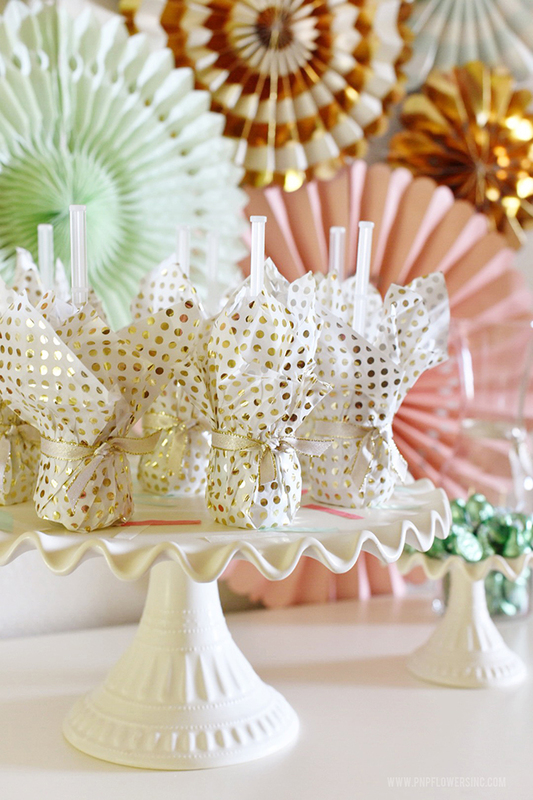 They are so easy to make and so fun as a centerpiece, party favor or reveal idea! Push Pop Containers with flat lids - there are dome lids out there which would prevent your poppers from standing up on their own. Confetti - I used some leftover white and gold crinkle cut packing from the order I placed with Paper Crush as well as some ivory + mint square tissue confetti - part of my order from Paper Crush. 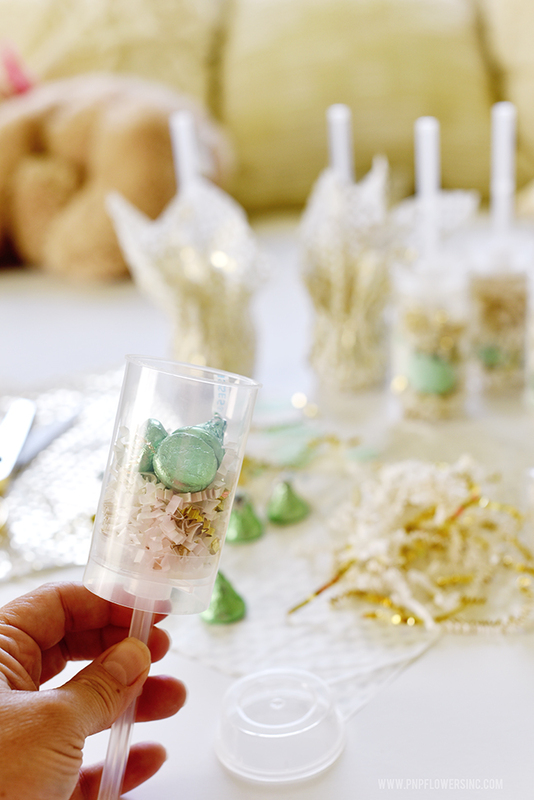 Stuff some crinkle cut confetti in the bottom of each push pop. Add some Hershey's Kisses - I used 3 for each container. 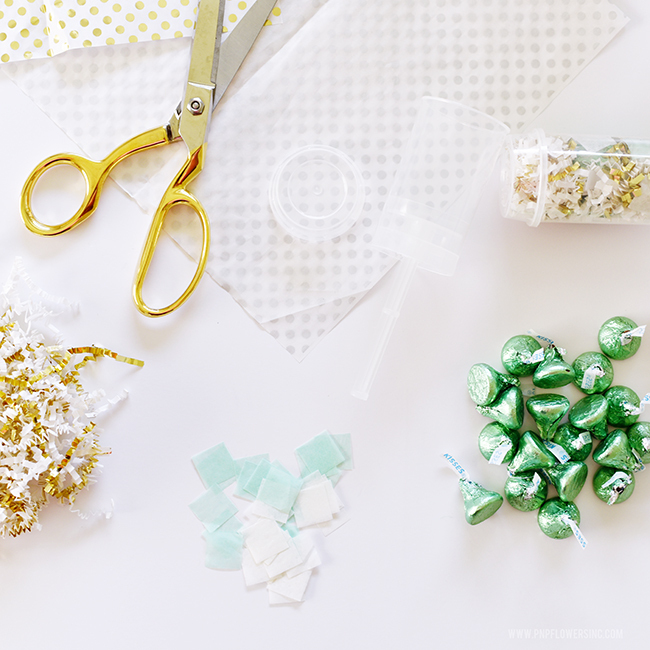 Add some colored tissue paper confetti. 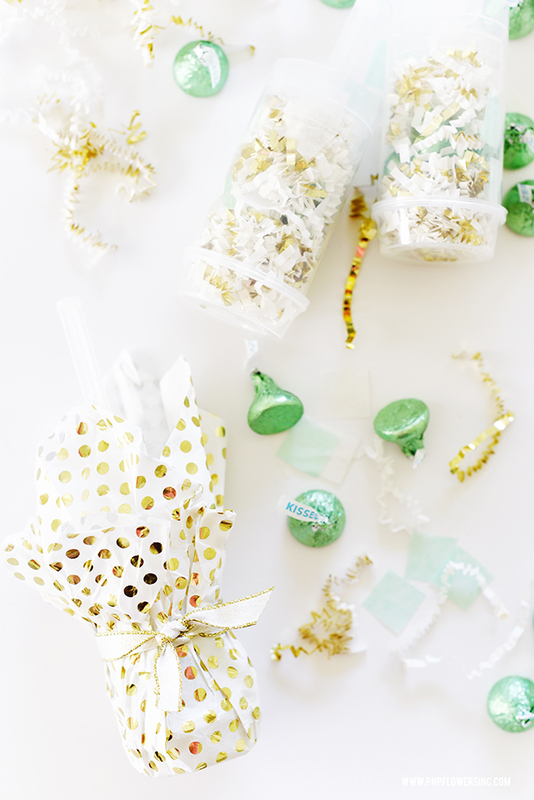 Top off with more crinkle cut confetti. 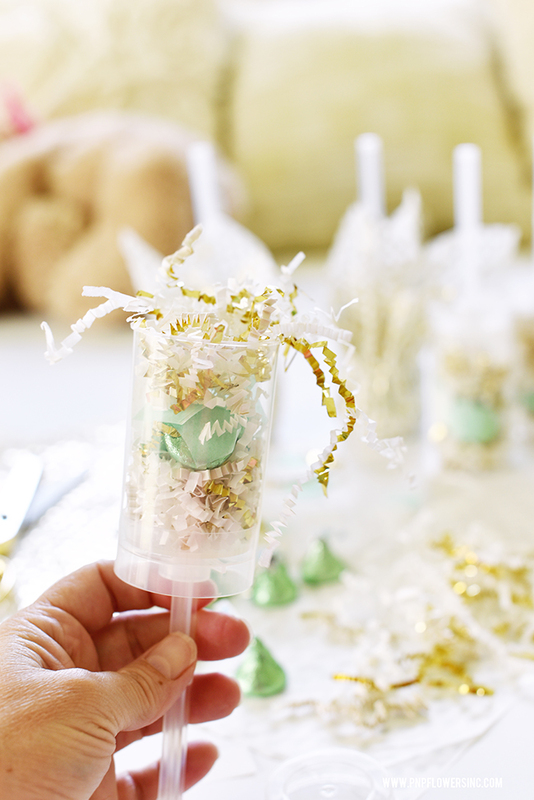 Wrap a square piece of tissue paper up around the filled push pop and tie a ribbon around it to secure. Each tissue paper wrap for the outside of the push pops was approximately a 10" square. My ribbon pieces measured about 12" long - but that was after I trimmed them down so give yourself some extra for tying purposes. 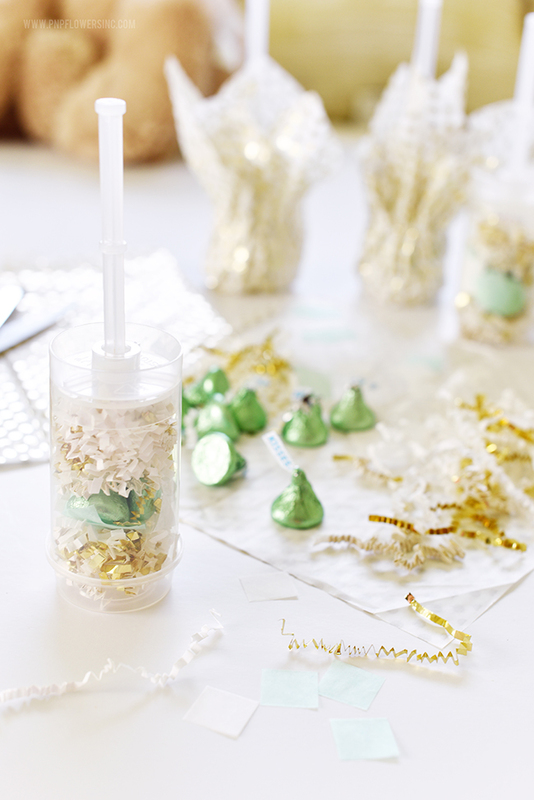 TIP: There are plenty of tutorials out there to make confetti poppers. Most all of the ones I saw did not use the lid to the container. I'm not sure if it was because the lids they had weren't flat or if they didn't think the poppers would work with the lid on. I tested my poppers with the lids on and they worked just fine. 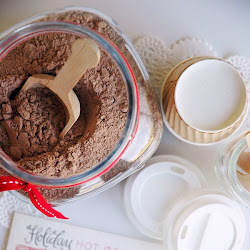 These are so easy and fun to make - even the littles can help!! If you haven't tried them out already, I hope you will! !